Since I am quite frequently working on my Mac via ssh I was in desperate need for a tool to monitor the input/output network traffic. I normally don’t need something like ethereal or tcpdump – I just need something that displays a graph and simple traffic statistics and last but not least updates itself frequently. So netstat is not usable for that purpose because it’s not the most concise tool I know. So ethereal and tcpdump are usually used for different purposes like traffic sniffing and dumping – So ahzf gave me the hint to look for something called “darkstat” – And yes: it’s a really useful tool. Darkstat runs on the host system and monitors the network interfaces. 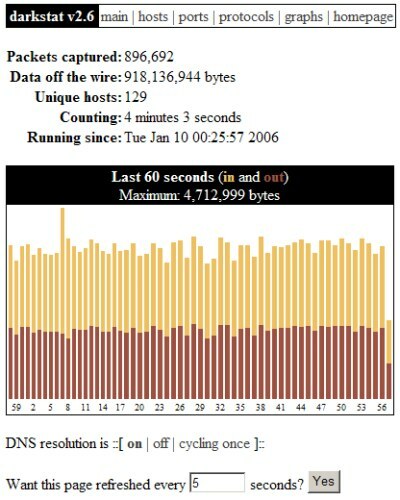 It also incorporates a webserver which allows you to take a look at the statistics. It’s a great tool that displays more detailed information when you click on the links in the menu bar. If you’re searching for a great network tool for your unix/mac – go for darkstat! I have to mention that darkstat is no longer under active development – sad but true.